Holidays in Praslin take you to the Seychelles’ very own Garden of Eden, once voted as one of the best islands in Africa by TripAdvisor. Holidaymakers will be greeted by an idyllic coastline of ice white sandy beaches lapped by turquoise waters, in addition to lush, green jungle. Families and couples will enjoy discovering the wealth of golden stretches of sands and hidden coves, while the more adventurous may prefer to go on safari in the Indian Ocean, where world class dive sites, rays, sharks and firefish gobys frequent the rainbow coloured coral reefs. Fairway fans will appreciate teeing off on the 18 hole golf course, which offers spectacular views of this stunning island. Praslin is the second largest island in the Seychelles after Mahe, offering a more serene and tranquil beach paradise. Fine cuisine awaits in excellent restaurants and beach eateries featuring the fresh catch of the day, Seychelles style. Sample your favourite dishes with a mouth watering Creole twist. Luxury holidays in Praslin transport you to an island of exquisite beaches, including the silvery sand of Anse Lazio and the peaceful Anse Kerlan, popular with the local sea turtles. In the centre of the island, you will be greeted by Praslin National Park where you can meet the resident wildlife, including the black parrot and red beaked bulbul. Guests can also explore the UNESCO listed, unspoilt Vallee de Mai Nature Reserve; providing a trail of coco de mer palms and delightful flora through the rainforest. At Sovereign we understand that one size does not fit all, which is why we offer advice and knowledge to help you design your perfect and unique luxury holiday in Praslin, helping you create lifelong memories. Stay at the Coco de Mer in Praslin for an intimate, modern, boutique holiday experience among spectacular natural surroundings, or the Constance Lemuria for a luxury hideaway nestled between two pristine beaches, frequented by the resident turtles, as well as offering an 18 hole golf course. Turn your back on the famous white-ribbon beaches of Praslin, and you’ll be faced with miles of tumbling green hills. This is Praslin National Park – part of a sharp granite mountain range caked in rainforest. Some of it is original prehistoric growth, while endemic species like the giant coco de mer palm tree date back 300 years. Short on time? Head straight for the Vallé de Mai. Its pristine rainforest is on the UNESCO World Heritage List, best explored with a local guide or with a map from the visitors' office. 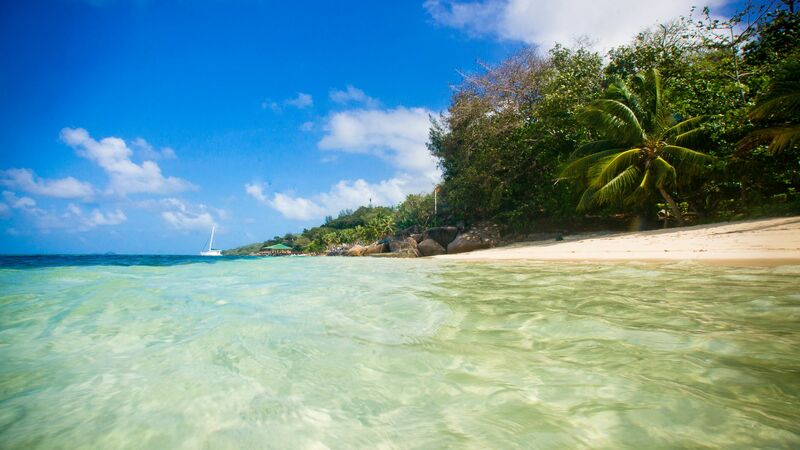 Direct flights from the UK to the Seychelles take approximately 10 hours. You can also choose to fly via the Middle East. Once you arrive in the Seychelles, Praslin is a 20-minute flight away. 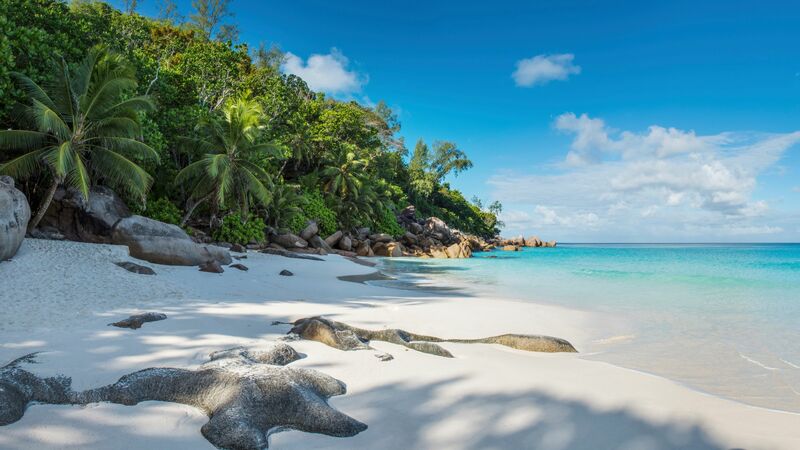 The Seychelles keeps a steady temperature all year round, with the mercury usually hovering between 24°C and 32°C. April marks the end of the rainy season, warming up in time for May – the sunniest month of the year. July is the coolest month, with temperatures dropping down to a comfortable 24°C. November is the beginning of summer in the Southern Hemisphere, so the temperatures rise and the number of rainy days slowly start to increase. The Seychelles is completely visa-free. Officials will just hand you a visitor’s permit when you go through customs. Just make sure you have your passport, details of where you’re staying and proof of onward travel (i.e. details of your flights back home). A 5-10% service tax is added to bills in most hotels, restaurants and bars. Feel free to increase this if the service exceeds your expectations. English and French are the two most commonly spoken tongues, but Seychelles Creole is the official language.